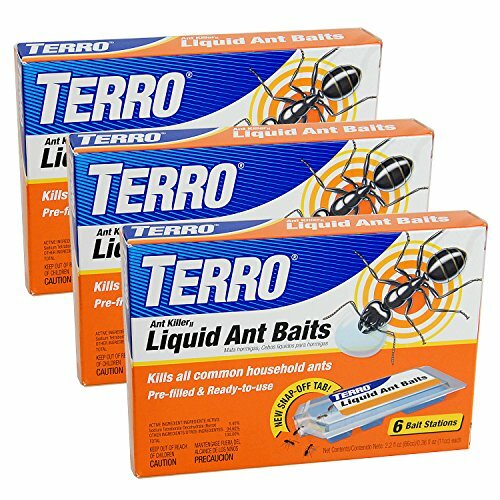 Attract and kill the ants you see and the ones you don’t with TERRO Liquid Ant Baits. The liquid, which contains borax, is specifically designed to allow worker ants to consume the product, survive long enough to carry the liquid back to the nest. Ants consume the liquid ant bait and return to the nest where they pass it around to the rest of the colony. The active ingredient in the bait slowly interferes with the ants’ digestive systems, ultimately killing them. Since this is a bait product, you will initially see more ants as they are attracted to the liquid – but don’t worry, this is a good thing. After the bait is consumed, insect populations will begin to decline. Complete control may take up to two weeks. For your convenience, TERRO Liquid Ant Baits are easy to use and feature a new and improved snap-off tab design – no scissors needed! To open the bait, hold the station vertically and twist the new and improved tab. Then place indoors on a flat surface near ant trails and other signs of ant activity. The more bait placements, the better. Be sure to leave the ant baits undisturbed while the ants are actively feeding on it.